July 12, 2016 in Black Liberation, Elections, Police & FBI, Vote Socialist Action. June 26, 2016 in Elections, Marxist Theory & History, Vote Socialist Action. 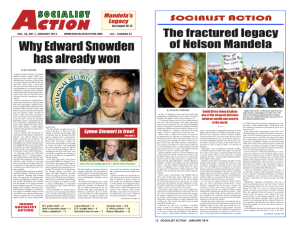 June 23, 2016 in Elections, Uncategorized, Vote Socialist Action. The presidential election: What’s left? June 13, 2016 in Elections. June 11, 2016 in Elections, Uncategorized. May 12, 2016 in Elections, Uncategorized. March 5, 2016 in Black Liberation, Elections, Marxist Theory & History. February 17, 2016 in Elections, Marxist Theory & History, San Francisco Bay Area. September 30, 2015 in Civil Liberties, Elections, Women's Liberation. September 24, 2015 in Economy, Elections, Labor. September 5, 2015 in Elections, Labor. Is Sanders campaign a ‘new movement’? August 8, 2015 in Elections. August 5, 2015 in Black Liberation, Elections. July 3, 2015 in Elections, Environment. June 21, 2015 in Elections. June 10, 2015 in Elections, Marxist Theory & History. June 4, 2015 in Elections. December 11, 2014 in Economy, Elections. February 13, 2014 in Elections.